City Attorney Jim Delapoer shows the council a map outlining where dispensaries would be allowed under an ordinance the council debated at Monday’s work session. For the umpteenth time, the Albany City Council plowed the same ground Monday on the subject of medical marijuana dispensaries, which the legislature has authorized local governments to either ban for a year or control with “reasonable regulations.” The outcome, as far as anybody can be sure of anything in this shifting debate, is that the council on Wednesday will vote on — and possibly adopt with the mayor casting the deciding vote to resolve a 3-3 council split — an ordinance that allows state-licensed dispensaries but bans them within 300 feet of any land zoned residential. State law limits licensed medical marijuana stores to non-residential zones such as commercial and industrial and says they must be 1,000 feet from a school as well as from each other. The 30-foot exclusion belt around residential zones is what the pending Albany ordinance would add, besides also imposing a $150 annual fee, but it also exempts from the 300-foot limit any dispensary in an industrial zone. Mayor Konopa studies the map. This would allow Canna Kitchen on S.W. Ferry Street to continue because, even though it’s within 300 feet of a residential zone, its storefront is in a light industrial district. Another dispensary, already licensed by the state, is Albany Alternative Health Solutions at 820 Pacific Blvd. S.E. The address is in a commercial zone and far enough from residential not to be affected by the 300-foot ban. 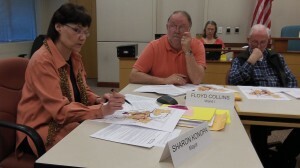 At Monday’s work session, Councilors Rich Kellum, Bessie Johnson and Floyd Collins continued to argue for a one-year ban on dispensaries, even though they lost that vote on April 9. 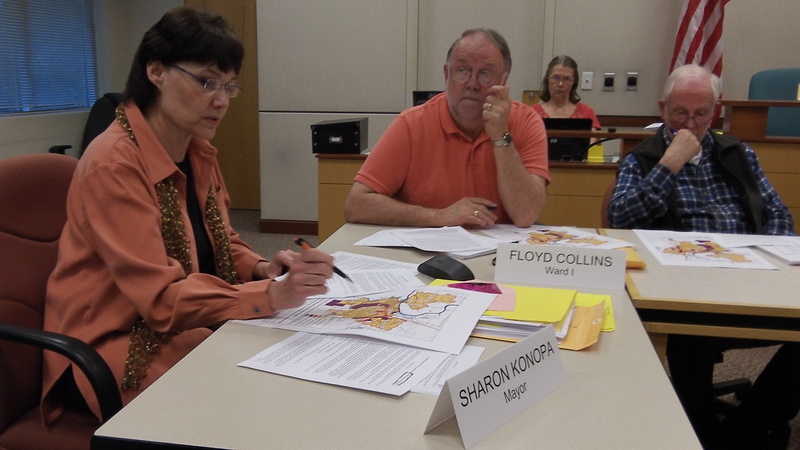 Mayor Sharon Konopa sought to add a phrase to the pending regulation ordinance to apply the same distance from residential to stores selling recreational marijuana in case an initiative or the legislature legalizes pot completely. But City Attorney Jim Delapoer advised against this, saying he didn’t think such a provision could survive a challenge unless state law specifically authorizes it. Konopa says she just wants to make sure to save Albany’s residential neighborhoods from marijuana stores that might set up in any of the many small pockets of “neighborhood commercial” zoning. “I want to make sure our neighborhoods areprotected,” she said. 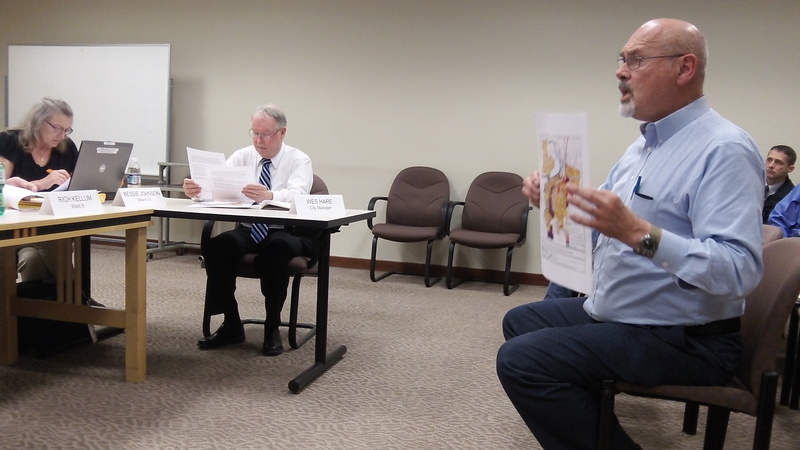 Monday’s work session featured most the same arguments the council made or heard before. It heard from medical marijuana advocates against any ban and from a couple of speakers contending the “business community” wanted a ban. Opponents made it sound as though dispensaries would jeopardize other businesses, or their employees, or the community in general, or children in particular. “I know what it can do, and it’s not something we want in Albany,” Councilor Johnson declared. Councilor Ray Kopczynski tried to counter such reasoning by asking if anybody knew of any problems associated with Canna Kitchen or Alternative Health Solutions. No one spoke up. Solutions has been licensed for only two weeks, but Kitchen has been operating for two years, supplying more than 200 people with medical marijuana in non-smoking form such a pills and ointments.